This week’s entries are dedicated to objects featured in the exhibition Thom Browne Selects, currently on view at Cooper Hewitt through October 23, 2016. Jim Dine’s impressive career started not long after he had graduated from Ohio University with a BFA in 1957. After making the move to New York in 1959, Dine collaborated with chief modern artists such as Claes Oldenburg, Allen Kaprow, and John Cage to perform the famed Happenings, which incorporated all media, including music and performance, in an effort to minimize the fissure between art and life. These Happenings could be seen as a precursor to Dine’s future assemblages. His use of ready-made, everyday objects and engagement with Pop Art subject matter made him a powerful voice in the emerging movement. Dine was raised by his grandparents after his mother’s death in 1947. His family was in the hardware business and he had significant exposure to hand tools at his grandfather’s store. In an interview with Tate Modern, Dine explains, “I grew up with tools. I came from a family of people who sold tools and I’ve always been enchanted by these objects made by anonymous hands.” The presence of tools in Dine’s work is a recurring theme. The connection and appreciation he formed with these inanimate objects is strong and consistent. 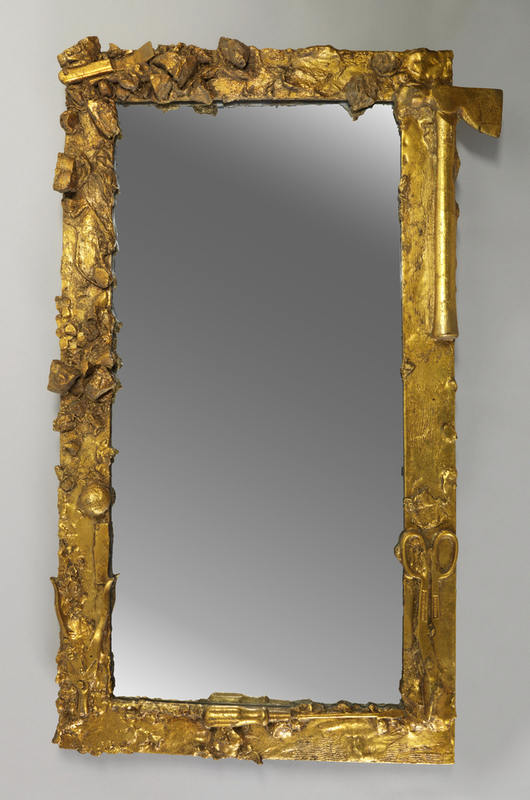 He later speaks of art as “bringing something to consciousness,” which is absolutely seen with these unified gold units decorating the frame of the mirror. The quirkiness of the tools’ inclusion reorients the everyday object, redefining what it was made for and how it was to be used. Furthermore, this particular piece was site specific and intended for the opulent Biltmore Hotel, a space that exuded luxury and excess. The mirror sets up a tension with its mundane accoutrement that decidedly got the memo on luxe. The pieces are no longer underdressed in their original wooden or plastic handles and silver extensions. They are primped, gilt, and ready to impress amongst the Hollywood glamour. Emily Birzak is a graduate student at Parsons studying History of Design and Curatorial Studies and serves as a fellow in the Product Design and Decorative Arts department. Currently, her interests lie in fashion and its position in business and the arts.